While Chicago has been known as a reputable city in hip-hop for numerous years now, this revered position has not arrived without the constant innovation and hard work of the artists that so faithfully represent the prowess of their home city. It is these artists that we have to credit for this respected reputation, and we here at Lyrical Lemonade try to honor this in every way possible by constantly bringing new Chicago acts into our headlines here on our website. 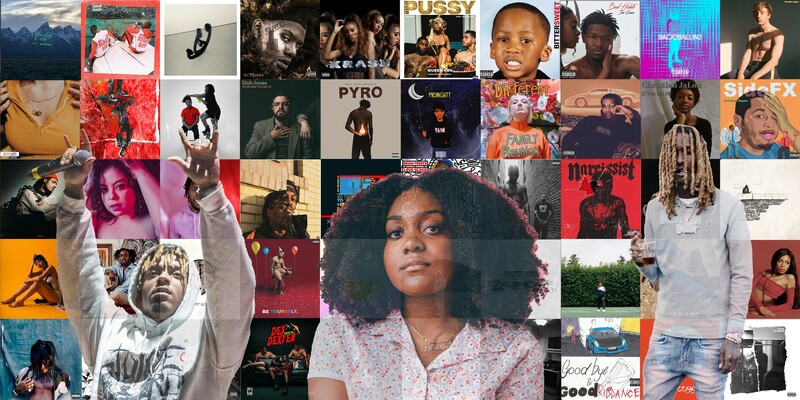 That said, 2018 has been yet another fantastic year for Chicago music, so we went ahead and compiled a list of our “Top 50 Chicago Projects” of the year. This now marks the third year that we have been putting out this list, and we believe that it’s safe to say this year’s list might just be the most solid one from top to bottom that we’ve seen yet. Thank you to our terrific writing staff for all of the hard work they have put in this year, I will be linking their socials below so be sure to contact them about getting featured on the website in the future. Wemmymo is an uptown Chicago emcee who I got in tune with about a year ago, and this year, the rising talent released a truly great record with Bittersweet. 11 tracks long, this project doesn’t shy away from stepping out of its comfort zone, as it features a ton of creative ideas and concepts that Wemmy executed flawlessly — for example, the back and forth he had on the radio on the record titled “Love Docta”. Also alluring, one of the reasons I love this project aside from Wemmy’s performance itself is the production, as you will find him flipping plenty of classics that any hip-hop head will be sure to recognize and enjoy upon listening. I’m certainly excited to see where Wemmy takes it from here, but in the meantime, congratulations on the release of this tape from us at LL! Chicago native Rich Jones is a huge staple in our hip-hop community. He does a ton of behind the scenes work that no ones sees and certainly deserves to be credited, but more importantly, he dropped an amazing project this year with “The Shoulder You Lean On”. There are only seven songs provided on this new project, but each and every one of them are timeless. The intro record “Coin Toss” is a favorite of mine this year and it only continues to get better after this one, keeping the momentum throughout in ways that will surely keep listeners entertained. That said, I didn’t expect anything less from Rich, and I had a strong feeling that this new tape was going to be excellent when I first heard it — surely enough, Jones came through with just that. Stream this brand new project below and if you like it be sure to share it with a friend! Josi Green is an emcee that we have been in tune with for some years, he used to pop out to our cyphers back in the day and in 2018 he released a good project titled “Bad Habits”. Josi Green has been blessing us with some good music for years now, it has been dope to watch him mature & progress as an artist, and as a fan, I am happy to say that this new project is his best work to date. It doesn’t take much more than a song or two into the tape to see that the production on this project is serious, Josi connected with Ro Marsalis & Gold Haze who produced this tape in its entirety & man did they lace him with some heat to rhyme over. All nine of these songs provided flowed together in perfect cohesiveness making for a great all around tape, but don’t take my word for it, click play below and judge for yourself. Every artist’s debut project marks a monumental moment in their career. It’s a chance to introduce oneself to the world and craft the artistic image that fans will recognize you with, but more than this, it’s a chance to figure out what you want to say to the world. With Jack Larsen’s debut EP, Push Ups, it is clear that the Chicago talent took all of this and more into consideration in order to make the most thoughtful project he possibly could. That said, the thought that Larsen decided to communicate with Push Ups is one of emotional maturity and the idea of moving on in life. Using a lush background of instrumentation to complement his delicate cadences, Larsen finds himself in a vulnerable state, looking toward the ways in which he can grow as a person, day by day. The resulting yield is a coming-of-age project that garners attention with ease, and undoubtedly, it will help bloom Larsen into the star that he so clearly has the potential to be. Watch out for more from the Chicago talent in the coming year. Those still unfamiliar with Sydny August are truly doing themselves a disservice. The gifted singer released her August Project EP in the middle of the year adding a bit of love written R&B for fans. The five-track, 17-minute EP successfully establishes Sydny as a voice and artist to watch out as we prepare for the new year. August displays her versatility on the project over an array of production that highlights her strength as a songwriter and singer. The EP’s opening track, “Remind Me” is a love-soaked ballad displaying the angelic stylings of August’s voice that is quickly transitioned on the up-tempo production of “Like That.” Creating a unique blend of R&B and electronic-pop, August creates an overwhelming moment on each track. A telling sign of her talent and self-awareness as an artist, August doesn’t stray away from allowing the production to breathe. Thoughtfully allowing her production to speak for her at times, August creates truly intimate moments on her new EP. This was the only offering we receive from August during 2018 whose last EP, 6th Floor, was shared in October of last year. If it isn’t apparent by now, we are truly ecstatic to have received new music from the promising young artist who will undoubtedly be turning heads in 2019. UG Vavy is a natural entertainer. With melodic cadences and a commanding vocal presence, he knows just how to cultivate replay value, and no better proof of this exists than the Chicago talent’s 2018 project, Inferno. As the title denotes, this tape shows us that UG Vavy is a flamethrower of an artist, ready to grab the world’s attention with every successive note that comes out of his mouth. He thrives with all eyes on him, and if not anything else Inferno shows that Vavy doesn’t crack under pressure, choosing to rise up to the challenge rather than shy away at the prospect of possible criticisms. This creates a point of inspiration in the Chicago native’s success-minded anthems, as the Chicago native gets ready to will himself to the top and take the music world by storm in 2019. Potential is on his side, so keep an eye out for more from the Inferno rapper in the months to come. Living up to expectations of others is an endless fight, and one that can be avoided simply by learning to love and embrace individuality. Matt Muse is here to communicate this very message with his latest project, Nappy Talk, using his voice as an artist to find comfortability in being himself. Throughout 7 songs, the budding talent lets out high-energy deliveries alongside galvanizing production to explain the importance of his most prolific aspect of self, his hair. While this theme of being comfortable in one’s own skin may seem cliche, the ways in which Muse chooses to communicate his message are clever in technique while inspiring in sentiment, as the conviction in his voice is sure to hold the attention of listeners, one song at a time. By identifying a goal and seeing it all the way through, Nappy Talk will be sure to hold its importance for years to come, granting it a well-deserved spot on our year-end list. As Adot rises in Chicago’s underground scene, his strength as an artist only seems to come up with him. The latest leap in his progression came earlier this year in the form of ‘MIDNIGHTT’, a dive into the dreary world of the local rapper and the most cohesive statement from him so far. Sticking to his monotonous, cold style, Adot effortlessly finds his footing on heavy trap beats and never goes out of character over 10 tracks. His refusal to compromise his own sound works as one of his strongest assets on ‘MIDNIGHTT’, and this level of genuineness allows Adot to stand out from the pack in a way that’s always refreshing and intriguing. 2018 marked a milestone year for Adot, and ‘MIDNIGHTT’ represents an important landmark in the rapper’s ongoing rise. Easily one of the most dynamic projects released this year has to be from the creative genius, Phoelix. Known for his work on countless projects from Smino to Noname to Saba, Phoelix delivered a powerful solo project that shows why he is one of the most coveted collaborators in the industry. His 2018 full length offering titled Tempo is special, and it doesn’t take more than one listen to see why. Phoelix sets his own pace during the album, choosing when to speed things up and slow things down. His skills as a composer are on full display during the project that manages to engulf you in sound from the moment you press play. Phoelix takes the opportunity to remind listeners of his lyrical prowess both in Spanish and English. Each track is its own moment, filled with a sonic orchestration that only Phoelix could arrange. The multi-instrumentalist recruits his friends and frequent collaborators; Smino, Jean Deaux and Dax for the 18-track, 54-minute ride. If Tempo proves anything, it’s that Phoelix is a truly exceptional artist that seems to ooze captivating mixtures of hip-hop, R&B, funk, jazz and neo-soul. What makes Family Reunion such a lovable is act is her quirky, true-to-self personality. In every release we’ve received from the Chicago-bred crooner to date, she’s found this identity in the form of eccentric guitar riffs and strong-hearted, infectious vocals, and in 2018, she cemented this with her latest, 3-song project, the Different EP. Following up the basis of style set in her past projects and singles, this EP offers fans a clear view of a proudly eclectic artist who you seemingly can’t help but root for. She’s fun, she’s honest, and more than anything, she’s talented, making for a trifecta of features that speak to why Family Reunion is about to have a massively prosperous 2019. While we never quite know what magic the Chicago-based artist has in store for the future, we can certainly confirm that the Different EP made her a standout act of 2018, certainly deserving of a spot on our year-end list. One of the more underrated projects on this list was Amir Tripp’s full-length project, PYRO, that dropped way back in March. Providing something for every kind of listener possible, this tape brings forth a perfect balance of introspective & thoughtful tunes as well as your up-tempo bangers & laid back songs. Also notable, there are only two impressive features on this project from Chicago’s own Saba on “Dark Knight” & King Louie on “WAV”, which are arguably my favorite cuts off this tape. Early on in 2018, this project was in my rotation frequently as well as many others across the city, which is why he is landing at #40 on our year-end list. Be sure to check out this record below and don’t be surprised when you hear more about Amir Tripp on Lyrical Lemonade in the coming year! Chicago songbird Kaina’s 4u project came to our attention as a top Chicago release of 2018 mainly due to its velvety sound and rich, addictive instrumentation. On 4u, Kaina is able to communicate her messages in short amounts of time that keep listeners captivated throughout, and by executing on a noteworthy level of authenticity, her jump back into the spotlight has been both seamless and impressive in ways that have us very excited for the future of the Chicago native’s career. With the magic of jazz and the simplistic allure of bedroom vocals, Kaina’s 2018 project is able to deliver on multiple levels of lovable sound and emotion, so make sure you don’t let this one slip through the cracks. Give it a listen below and be ready for more on the way from Chicago’s own in 2019! Numbers don’t reflect just how talented Christian JaLon is. She may only have 550 monthly listeners on Spotify, but with the endless supply of talent that the Chicago talent possesses, it’s clear that this is bound to change in 2019. The basis of this potential arrives from JaLon’s 2018 project, If You Let Me — a deeply emotional record that uses the sound and feel of smooth R&B to its advantage simply by speaking out JaLon’s full, undiluted truths. It’s all on the surface, as JaLon doesn’t use a ploy or special effect to create a fake image behind her singing. Rather, this budding artist is naturally one of the most talented coming out of Chicago right now, and nothing is more entertaining than the allure of her all-natural ways that will leave throwing this entire tape on repeat over and over, just as we did here at Lyrical Lemonade. Only 7 tracks long, If You Let Me is sure to make a lasting splash in this Chicago native’s career, and we can’t wait for what JaLon is about to do in 2019. The sky’s the limit for the ever-so-talented vocalist. At a time when hip-hop artists come-and-go quicker than ever before, consistency has become an impressive and rare quality to come by. For the past 3+ years, Melo Makes Music has been a sustained force in Chicago’s underground scene and his latest EP shows he’s just getting started. ‘Hold Your Tongue’ comes wrapped in layers of angst and aggression, channeled into experimental production and punctual raps that strike with brute force. Whether he’s literally screaming on track’s like “Blastaa” or uniting with Supa Bwe on a guitar-heavy ballad like “Edge”, Melo fills the 9-track project with one unexpected detour after the other. His versatility and stylistic consistency are his strong points, and he wields those qualities to make a poignant statement for his own artistry with ’Hold Your Tongue. Sterling Hayes is the kind of artist whose music refuses to take a step back. It seems as though with every new song, the Chicago native is moving his artistry and talent a step further, and no project better reflects this than Hayes’ 2018 effort, SideFX. As noted by the title, this tape reflects all of the side effects that have arrived with life for Sterling Hayes throughout the year. Between success, failures, ambitions, and demons, the budding talent has seen it all in 2018, and SideFX is sure to log all of this, describing these themes in ways that fans will easily understand and resonate with. The hard-nosed charisma of such a reflective project is an unavoidable element of its prowess, and if not anything else, this tape should remind us all that Sterling Hayes is slated to continue moving forward throughout 2019. SideFX is a learning moment for the star of the show and the audience alike, just the way it should be. One of the standout projects from Chicago this year for me was Ajani Jones Cocoons, which is making its way at number thirty-two on our list. It was a short, sweet and pretty straightforward project, as Ajani did a fantastic job creating a memorable body of work that he can build off of for years to come. The lone feature on this project came from his fellow Closed Sessions artist Kweku Collins on the record “Pyramids”, which was by far the record that helped propel Ajani the most this year. All in all, Ajani Jones has been making his impact felt in the Chicago community for the past couple of years, but this tape is what most people will remember as his introduction into the scene, giving it a well-deserved spot on our year-end list! Pivot Gang is supplying the world with some of the finest music coming out of Chicago right now, and amidst the camp’s top performers is Joseph Chilliams, proving himself in 2018 with his fantastic EP, The Plastics. Just 4 tracks long, this project is sure to pack a punch within its short run time, as Chilliams makes his introduction with an energetic attitude and sleek pen, notably impressing listeners with a sharp mind for his musical strengths. The Chicago native not only communicates themes that apply to his own career and life, but also brings forth ideas that act as universal connectors between fans, bringing together Pivot Gang and its loyal following in a way that simply demands to be mentioned in Lyrical Lemonade’s year-end list. Joseph Chilliams is certainly a top performer to keep an eye on in the coming year, so stream The Plastics below and hear the bubbling of his potential as we await new music! There weren’t many artists from the city that you could compare to Queen Key as far as impact goes this year, as she stormed onto the scene and made her presence felt in 2018, thanks, in a large part, to the release of her full-length project, Eat My P*ssy. The dense, boldly charismatic seven-track effort that she unleashed back in June had a handful of bangers and a star studded feature list, as she collaborated with artists such as Tink, King Louie, Dreezy, and even Cuban Doll! Queen Key paved a way for herself to become one of the best artists out of Chicago not only in 2018, but in the coming year, and we here at Lyrical Lemonade only see her continuing to improve as an artist as time goes on. The future is bright for Queen Key, so keep an out for new releases to come and in the meantime, stream her latest project below! Certain entities are associated with quality, I’m sure by the time you finish reading this sentence you would have thought of a few. These same principles apply to famed rap collective, SAVEMONEY. One of the collective’s most talented members, Brian Fresco, released his new album, Love Scars, in early March of this year. Holding nothing back, Fresco delivered a powerful and diverse set of tracks that furthered his legacy as one of Chicago’s greatest. The SAVEMONEY member delivers masterful wordplay, riveting storytelling and jaw-dropping features from; Twista, Kami, Chance the Rapper, MC Juice, Vic Mensa and Rockie Fresh. The star-studded list of features also applies to the elite producers who worked on the project; Thelonious Martin, Snapback and Swim Team. The 15-track, 53-minute production is an honest reflection that follows the theme of the title. Somehow, Fresco manages to touch on a spectrum of topics that has us jumping in excitement and becoming teary-eyed at the same time. Brian Fresco’s 2018 offering was nothing short of spectacular cementing his place as one of the most exciting MC’s to reside in Chicago. On her debut EP ‘TOXIC’, Tatiana Hazel offers up 7-tracks of pure pop and dance music without losing sight of herself for one second. Striking a balance between vulnerability and rawness, Hazel’s sharp pen gives ‘Toxic’ a layer of earnestness that too often falls to the wayside on pop records. On top of this bare-boned songwriting style, she fills every lyric with her vibrato-charged vocals, ingraining her voice in your brain the second you hit play. Her mix of fragility and bravado gets met with production you can’t help but dance to, acting as a reminder to not take life too seriously sometimes. Tatiana Hazel introduces herself on ‘TOXIC’ as a promising pop prospect out of Chicago and makes her case as a voice currently missing in the mainstream. Already known for his alien-like approach to rap, it’s only right that Adamn Killa turned things up a notch for ‘Back 2 Ballin 2’. Adamn’s knack for mixing an experimental approach to hip-hop with an equally strong ear for hooky flows works to his advantage throughout this project, making it one of his most cohesive to date. He doesn’t hold back when it comes to off-kilter lyricism either, filling each verse with a bar or two that could make any listener do a double-take. Backing up Adamn’s patented weirdness are some heavy hitters when it comes to production, namely proven hitmaker TM88 who contributes some of the most addictive beats on this project. With ‘Back 2 Ballin 2’, Adamn Killa reminds listeners that there’s no one out there who sounds quite like him and delivers a project of bangers with otherworldly flair. I’ve been hip to Jean Deaux for some time now, and throughout my time as a fan of hers, I must say that the Chicago native’s sound is only getting smoother and smoother with each new release. That said, all year long, Deaux has been tapped into a frequency of hazy deliveries and gorgeous, heart-led deliveries — two elements which fuel the overwhelming beauty of her latest project, Krash. Enlisting a talent-filled army of Saba, THEM People, Phoelix, AMAC, ROMderful, and Smino on the boards as well as a feature verse from fellow crooner Ravyn Lenae, this tape possesses the perfect cast of characters to make a splash, and without a surprise, that’s exactly what Krash was able to do. Heading into 2019, the heads are turned toward Deaux and her silky smooth singing style, so be sure not to sleep. Krash is a reminder that Deaux is on a rapid ascent toward the top right now, and I estimate that it won’t be long until she’s ready to take on the top charts and hold her own. El Hitta is the kind of artist that makes bangers with machine-like consistency. He has no problem unlocking the hardest aspects of his artistry one song after the next and as a result, his 2018 project, Owe Nobody Nothin, deserves a spot on our list due to its rapid-paced, in-your-face energy. As the title denotes, Hitta is at his prime level of confidence with this tape, paving his own lane and dodging all of the distractions that attempt to derail his success. He owes nobody nothing, and with this, he’s here to take over Chicago and claim what he believes is rightfully is. With trunk-rattling production to match, the newest from El Hitta shows clear signs of promise for the coming future, so much so that I would say it’s only a matter of time until Hitta gets his well-deserved hit-making recognition. Stream Owe Nobody Nothin below and keep a keen eye out for more from the Chicago native in 2019. Consistency is key in today’s rap game and no one has been as consistent as Qari. The release of his long-awaited 2018 project, No Time to Explain, defiantly marks the line in the sand. Qari keeps getting better and it’s becoming more and more apparent that he has sights set on the top. Linking up with his frequent collaborator and friend, Mulatto Beats, the two deliver a wavy production that is perfect for every setting. The bite-size project which totals out at nine-tracks with a run time of 25-minutes highlights everything we love about Qari; his hazy flow, clever construction of rhymes and unfaltering drip over a set of filthy production. Qari is in a lane of his own, rapping with effortless confidence he commands your attention on every track. Battling the bass-heavy production for your attention, Qari creates an exciting push and pull on each track. The push and pull No Time to Explain is Qari’s first and only project of 2018 coming off the heels of his 2017 mixtape, Space Jam. Creating at his own pace, Qari doesn’t release anything other than quality content whether in the form of music or visuals. We are truly excited and already anxious to see what the gifted MC has in store for us next year. The phrase “be yourself” is a cliche that we’ve all heard throughout our lives. That doesn’t mean that it can’t be updated or ever assigned new meaning, though. As shown in Taylor Bennett’s fantastic 2018 effort of the same name, this saying can take on the narrative that no matter what sexuality, race, social class, or background you possess, there’s nothing more freeing and rewarding than being yourself. While this can be a hard lesson to actually demonstrate in a real-life context, Bennett’s sleek rhymes and alluring, warm charisma surely gives listeners the right listening environment to believe the words “be yourself” beyond just being a cliche, and for that, we need to celebrate this project. Taylor Bennett is making music and creating entirely on his own terms, giving new life to his energetic style that we can all enjoy and learn from. Looking back on 2018, Be Yourself was surely one of the most true-to-self projects I heard all year, and I think I speak for us all at LL when I say that it’s only going to lead to even bigger and better things for Bennett in 2019. Stream this one below and always remember: be. yourself. The story of Duffle Bag Buru is certainly an interesting one. He has been placed in many different walks of life and his music reflects that, making all different types of sounds that appeal to a breadth of listeners with a worldly perspective. Just a few months ago, Buru unleashed his EP titled Narcissist, containing some of his finest music to date that has deservedly gained him a spot at number twenty-five on our list. Everything on this tape just had a special feeling to it, as the production was noticeably clean, crisp and hard knocking, while the verses were even better. Duffle Bag Buru is long from finished and we here at Lyrical Lemonade expect huge things from him in the future, so be sure to get in tune by checking out his brand new project at the link below! If you’ve been paying attention to the growth of Chicago rap in recent years, you’re probably hip to the talents of Savemoney affiliates, Kami and Smoko Ono. These two artists have been putting on for their home city for quite some time now, and in 2018, they even decided to bless the world with a much-deserved collaborative project, Very Slight. At face value, this album was a refreshing sight to see as it features two well known veterans showing off the new sounds and styles that they’ve been perfecting in recent years. However, even beyond this personal attachment based on their past releases, it’s also a fantastic project based on pure skill and innovation, as Smoko Ono and Kami each keep things ambitious and fun in order to move their chemistry forward. When compared to Kami’s 2017 effort, Just Like the Movies, Very Slight proves to take on a unique, more hard-hitting creative direction, and as a direct consequence, it certainly translates the Chicago talent’s signature & charismatic deliveries into the form of bass-booming tracks that fans of all types will love. As the cherries on top, this one also brings the Savemoney family back together with features from Chance the Rapper and Joey Purp. Very Slight was a fantastic moment for fans of Chicago rap, and it clearly shows us that Kami and Smoko Ono can still put together some heaters on demand. By far one of my favorite Chicago projects of the year was from the ever-so-talented duo Grapetooth, who released their flawless new self-titled album earlier this year. As I expected upon its release, this project has been in constant rotation for me ever since it came out, and even though my expectations rose high with the pre-released singles, Grapetooth certainly lived up to the hype and provided an even better main course to complement the appetizing singles. With ten solid records provided on this project, I can safely say that it’s everything I could have hoped for and more, flowing together like a movie soundtrack with seamless transitions and a smooth touch. Grapetooth is truly one of the best projects that I have listened to all year, so naturally, this one came in at a well-deserved number 23 on our year-end list. Savemoney superstar Towkio has been a favorite here at LL for years now, and this year found him releasing his best project to date back in May with “WWW.” There was a ton of anticipation around the release of this album because at the time it was the first full body of work we had heard from Towkio since April of 2015 when he blessed us with .WAV Theory. All that said to me though knowing Towkio as an artist was that he wanted to release something timeless, he wanted to create a unforgettable body of work and he truly did just that. The intro song “Swim” set the tone for the rest of the tape, starting with the line “New chapter, new page” before speaking on how he got to this point with a beautiful poetry like flow, and each of the twelve records that followed it were just as pleasing. All in all, 2018 was an amazing year for Towkio and we fully expect him to continue improving as an artist. Without a doubt, one of the best projects from the city this year was the Happiness EP from Appleby, an artist who has been putting out some great music for a minute now, but the best of his abilities are displayed here.The singles leading up to “Happiness” delivered that exact balance of rawness and catchiness, and the remainder of the EP builds off of that same energy. Over the seven tracks, Appleby and his go-to producer Elias Abid put together refreshingly simple compositions. Each song subtly builds, rising and falling in a way that adds dramatic flair without losing momentum. None of the instrumentation feels too obtrusive, leaving plenty of room for Appleby’s singing to be the main attraction—as it should be. While his breathy vocals float over subdued guitar riffs and twinkling pianos, Appleby writes songs that function like windows into his life where time seems to slow down. By doing so, he not only holds a listener’s attention but offers an extended look at the potential for greatness that he’s only given us mere glimpses of in the past. The music that Appleby creates is truly timeless, it’s the type of music that anyone can enjoy no matter what age they are. The crazy thought is that Appleby is just getting started, I know his best music is yet to be released. Listening to Tomorrow by The O’My’s feels like going to church over a span of eleven songs. The Chicago natives fill their music to the brim with artful soul and decadent sounds, making for one of the most refreshing projects I’ve heard throughout all of 2018 — needless to say, they needed to take a rightful spot on our year-end list. With that said, featuring collaborations with Chance the Rapper, Saba, and Peter CottonTale, The O’my’s put it all on the line with this one in order to create the most authentic album that possibly could, and they most certainly succeeded. As a result, Tomorrow separates itself from the ingenuine value of virality in 2018 and chooses to focus on the music, instead, proving their everlasting devotion toward making timeless art. This project is the kind that will have you rooting for The O’My’s after just one listen, so make sure you don’t sleep. Tomorrow is some of the best food for the soul I’ve ever tasted. Many fans know Chicago native Ric Wilson not only by his regular stage name, but also by the fitting nickname, Disco Ric. With this, over the years, Wilson has proven himself to have one of the grooviest, most infectious sounds out of Chicago, and in 2018, he brought this reputation to an entirely new level with the release of his stellar project, BANBA. Titled by an acronym that stands for “Black Art Not Bad Art”, this project holds true the theme of unapologetically expressing oneself in ways that listeners are sure to embrace and dance to. The funk atmosphere of the music seamlessly joins together with a soulful bounce, and the result is a project that is just as thoughtful as it is exhilarating, leading us to keep the nickname “Disco Ric” at the top of the mind, as always. BANBA is proof that Ric Wilson is slated to have yet another prosperous year in 2019, so make sure you keep an eye out for his future releases! Looking back on the hard work being put in by all of the artists on our list throughout 2018, Chief Keef’s 8-mixtape output this year just could not be ignored. As we’ve come to appreciate over time, the Chicago legend is relentless when it comes to putting out new music, always operating on his own schedule. Countless hours in the studio turn into numerous projects released within the span of a year, and these numerous projects turn into more and more hits to hep craft the legacy of such a prolific and influential artist of the 2010s. That said, in 2018, the projects we received from Keef were the following: Back From The Dead 3, The Leek Volumes 4, 5, & 6, The Cozart, Mansion Musick, and The GloFiles Parts 1 & 2. While we could have attempted to choose our favorite project of the bunch to put on this list, it felt disrespectful not to acknowledge the fact that most, if not all, of these tapes are contenders for a top spot in Keef’s 2018 catalog. Nevertheless, after a year of so many ups and downs for Chicago’s own, we’ve included them all as one entry. Chief Keef was on fire this year, and there’s no denying that his legacy will continue to grow on the heels of so many stellar releases. Here’s to an even brighter 2019 for the man himself. Few artists have seen as much growth in 2018 as Tobi Lou. With countless singles, a strong supply of new visuals, and both the Tobi Lou and the Loop and Tobi Lou and the Juice EPs under his belt, Lou seemingly hasn’t clocked out even for a second all year long, and the results show. We here at Lyrical Lemonade have been fans of Lou for a while, so to see him hone in on his craft and truly discover the sound and styles that define him best as an artist is a refreshing site to see. Between the smooth, relaxed sound of the Chicago native’s music and the wide-eyed subject matter that he’s able to communicate, it goes without saying that Tobi Lou’s 2019 will be one of the most impressive in Chicago’s variety of rising talent, and both of his 2018 EPs should act as testaments to this clear potential. Make sure you don’t sleep on this soon-to-be star in the coming year! Swervo is a moment of graduation for G Herbo. From the start of his growth as a standout figure in Chicago’s burgeoning drill scene to the front headlines of every major site upon the release of his new album, Herbo has found identity in the art of maturation and growth. These days, his family life and help toward troubled youth are the elements that make him the man he is, and as a result, Swervo comes across as quite possibly Herbo’s most refined offering to date. However, while his life has calmed down in some senses, his sound certainly hasn’t followed in quite the same pattern, as Swervo proves that it’s no rarity to hear the Chicago native pour his all into each and every song. Herbo is still the highly-passionate lyrical flamethrower that we all know and love, and with his latest, he offers machine-like flows and his signature, high-energy cadences to prove it — not to mention that the trunk-rattling production from Southside acts as the perfect alley oop to foster this sound. It is in this way that Swervo finds a healthy mixture of personal and artistic development, and from a listener’s perspective, this couldn’t be more refreshing. Herbo will surely continue to grow throughout 2019, and the way I see it, his development has been a privilege to witness. Few artists have garnered a reputation as venerable as Lupe Fiasco’s in the world of Chicago rap throughout the years. From lyrical trickery to the sophisticated thematic elements of his music, the CHI native has managed to devise worlds of his own creation with each successive album, and perhaps no project better suits this description than Fiasco’s 2018 effort, DROGAS WAVE. Rich in storytelling and buzzing remarkably in a creative sense, this album seemingly finds a Goldilocks-level of perfection hidden in the intersection of artistic ambition and hard-earned, undeniably impressive execution. Bar after bar, Lupe keeps it as dense and captivating as possible, while the plot of the project keeps listeners intrigued, emotionally invested, and ultimately moved throughout its entire duration. At 24 tracks, DROGAS WAVE is certainly a long project, but needless to say, it uses every moment as purposefully as possible, crafting a story that simply needs to be mentioned as a 2018 top-runner. Lupe really outdid himself with this one. With 2017’s iiiDrops, Joey Purp turned the heads of the rap game toward his direction, ready and willing to make his impact known on the genre that he had known and loved for so long. While this album was certainly a success, Purp returned to the spotlight even hungrier this year, expanding his palette of sounds and styles with a lively new album, QUARTERTHING. From the opening notes to the closing remarks, this project is packed to the brim with the life and times of an artist who thrives when all the attention is focused his way. Purp matches masterful storytelling with unique sonic direction and captivating stylistic direction, using his refreshing blend of influences to fuel one of 2018’s most diverse albums, from front to back. QUARTERTHING is, at heart, a highlight reel of sorts, and it reminds us that, as successful as he’s been so far, Joey Purp is still just getting started. The future is bright for Chicago’s own, so expect more greatness to come from his corner in 2019. Pieces of a Man is exactly what its title entails: a compilation of standout moments that work together to create the definition of one man, from his strengths to his weaknesses and everything in between. It just so happens that this man is one of Chicago’s most talented emcees, Mick Jenkins. Where Jenkins has always thrived has been in his charismatic mic presence and inimitably sharp way with words. All the way from the attention he received from his earliest mixtapes until now, the budding talent has experienced immense growth between each successive project, and his 2018 effort is a moment to look back on the all of the lessons he has learned along the way as well as what they have taught him about life. Pieces of a Man has a storytelling charm to it that few albums are able to achieve in such a knowledgeable manner, and with smooth, spirited music to back this up, it’s an easy addition to our year-end list. Mick Jenkins and his soulful sound are sure to keep pumping out classics for years to come, so be sure to keep an eye out for one of Chicago’s finest as we look toward 2019. In such a saturated music industry the ability to cut through the noise is lost on many, Femdot is not one of these people. The 23-year-old released his highly anticipated follow up to his Delacreme series with the second installment that delivers in every way possible. Femdot doesn’t miss a step as he lyrically deconstructs every beat on the album, his dense writing ability and throttling cadence allows for him to position himself into narrow pockets in production. The true talent comes from Femdot’s ability to use this high technical rapping skill to construct songs that not only require you to pay attention but also let loose and even cry. Femdot’s ability to be so relatable is another key facet of his talent. Using the 13-track album to delve into his frustrations with the collegiate university system, systemic racism and overall difficult as a young black man in America. The spectrum of talent displayed by the gifted MC is something to note and a telling sign of his future dominance in music. The self-reflective album is a true work of art in its ability to submerge you in the project, holding your attention for the entire 45-minute length. From production to songwriting and beyond, Femdot checks off all the boxes. It is going to be harder and harder to deny him his accolades, as Femdot will without fail have another impressive year in 2019. Cdot Honcho’s 2018 project, H4, is a direct embodiment of the word “relentless”. In terms of flows, lyrics, and sound, the Chicago native is going at top speeds with full control over his output, and as a result, he’s able to pave a unique lane of his own that makes for one of the most captivating styles out of Chicago right now. This unique sound can certainly be derived, in part, from drill, but to say that Honcho is a drill artist is simply a limitation of the way he thinks creatively. H4 is in a world of its own, and in the eyes of Honcho, it’s clear that this world knows no bounds, from the trunk-rattling production to his steamrolling cadences. Needless to say, H4 simply demanded a spot on our year-end list as a clear Chicago standout of 2018, and it will only lead toward even more hits to come in 2019. Cdot Honcho won’t be relaxing his full-court press anytime soon, so make sure you keep your head turned in his direction and show some love to a rising star! One of the most exciting acts to come out of Chicago right now is none other than Warhol.SS. The young MC released his fourteen-track album debut, Chest Pains, in early November to much acclaim, and by acting as a clear showcase of Warhol’s star-potential and noticeable firepower, it has certainly become recognized as a top Chicago project of 2018, in our eyes. Standout tracks like “Birds Nest,” “War Ready” and “Keep Heat” all find Warhol in his element, while bass-destroying production meshes seamlessly with his unique brand of muffled lyrical raps. Not only did the project deliver above and beyond Warhol’s high standards, but it also came equipped with high-caliber features and production credits. The pairing of producers such as Harry Fraud, Kenny Beats and CashMoney AP all validate Warhol’s ability to create with the best of them, and in just 36-minutes, fans also receive guest appearances from Rico Nasty, UnoTheActivist, Lil Duke, and HoodRich Pablo Juan. Warhol.SS is clearly about to explode as one of the biggest acts in hip-hop, and this release of his energy-packed album debut only adds fuel to the fire. We personally cannot wait to see what Warhol.SS is going to do in the coming year, but we are already positive we are going to love it. Beyond the fact that his lyrics are among the most quotable and most vivid in rap right now, Valee has become known for his trailblazing arsenal of flows, many of which have been imitated and stolen from blockbuster artists. However, the impenetrable line of defense that will always make Valee untouchable is that no matter how hard they try, no one can quite do it like the man himself. Valee is always one step ahead, and his major label debut, GOOD Job, You Found Me is direct proof of this, as it made waves all around the rap world as one of 2018’s standout releases. The replay value that arrives from addictive tracks such as “Miami” or “Vlone” is undeniable, and consequently, Valee’s latest full-length effort had me coming back week after week, always itching to hear new music from the Chicago wordsmith. That said, we here at LL feel confident in saying that Valee will continue to thrive as a major player in rap in 2019, and all signs are looking up, so don’t sleep. After a wait of two years since her last album, Telefone, Noname finally speaks her peace once again on her sophomore effort, Room 25. And thankfully so. As the budding Chicago star deems it, there was a time in which she was afraid the success and acclaim of Telefone was all just a fluke that might never live up to as an artist. However, with Room 25, Noname has proved to put these worries to rest, as she brings her childlike wonder and charming personality into a space of self-confidence and thought-provoking lyricism that has fans hanging onto every word she rhymes. The best part is, even while the world’s deeply ingrained love for the Chicago artist and her bubbling personality has only grown since Telefone, it should be known that in quite a beautiful way, so has Noname. She sails through Room 25 asking all the right questions with a masterful blend of personality and thoughtfulness, and as a result, Noname’s seasoned soul projects images of the way that her upbringing in Chicago has turned her into the soulful person that she is today. Room 25 was undoubtedly one of the best projects of 2018 on a national scale, and for these reasons and more, it simply had to claim a top spot on our year-end list for 2018. We here at Lyrical Lemonade have watched Lil Durk come up right in front of our eyes in recent years, and seeing the hard-earned success that Durk has found for himself, it should come as no surprise that his 2018 project, Signed to the Streets 3, proved to be one of the most refreshing listens of the year. While Durk has been known to craft hits in the past, it is with his latest offering that he capitalizes on this ever-present theme of maturity in his music, offering a well-rounded project that tells vivid tales of the budding star’s personal growth and success-minded attitude these days. ‘STTS3’ is direct in its message but artful in the way that it illustrates Durk’s rise to fame, and for outside listeners, it paints a clear vision of how Durk has come up out of Chicago and become such a prominent figure in the city’s rap culture, despite all of the obstacles that tried to tear him down along the way. Only adding fuel to the fire, this project also includes features from Future, Lil Baby, Gunna, Kodak Black, Kevin Gates, and Ty Dolla $ign, all of which add seamless energy to Durk’s hard-nosed style and perfectly exemplify his by-all-means perspective toward growth. That said, this twenty-record offering is the perfect full course to feed old fans and attract new listeners for Durk, so make sure you take this moment to reflect on the hard work that Durk put in to get here as you stream the album below! Lucki isn’t the kind of artist who likes to sugarcoat things, He’s direct and firm in his ways, offering chilling accounts of reality whether we’re ready for them or not. In April of 2018, this theme of authenticity was brought forth with the release of the Chicago native’s Days Before II EP. Just 6 tracks long, what this EP lacks in length it makes up for in substance, as Lucki’s voice is confident in its ways while simultaneously vulnerable in its message. The entire project is densely crafted without room for error, and perhaps its most impressive feature is the way it weaves through pressures and vices with a common wisdom that strings each idea together in a cohesive manner. Lucki’s muddy deliveries are sure to complement this captivating style, and the result is one of this year’s most impressive offerings, guaranteeing Days Before II a spot on our list of top Chicago projects of 2018. The latest from Lucki is a step toward the most refined, wide-eyed version of the Chicago native that we’ve heard to date, and from a fan’s perspective, it’s a highlight moment within his comprehensive catalog of quality tapes. Lucki had a standout year in 2018, so be sure to get ready for even more come 2019, because he surely won’t be slowing down anytime soon. Chicago has been privy to Famous Dex’s starpower for years now, and it’s exciting to see everyone else catching on. Filled to the brim with hits, his debut album, Dex Meets Dexter, marks the rapper’s proper introduction to the mainstream, and even while this well-deserved transition has been sudden, it goes without saying that Dex hasn’t lost any of his character in the process. In fact, Dex Meets Dexter just might be some of the best music from Dex that we’ve heard to date, as songs like “Japan” and “Pick It Up” lit wildfires across the world as a soundtrack to all of the good times throughout 2018. That said, with all heads turned in his direction, Famous Dex is surely on a path toward even more success in 2018, so make sure you’re ready. Chicago’s own is ready to continue taking over the top charts, one hit at a time. Acting as a breath of fresh air, free of outside influence and unapologetic in its quest of finding the power in oneself, 2018 was a blockbuster year for Chicago legend Kanye West. Amidst all of the magic going on in the mountains of Wyoming, he was able to release 5 new projects from G.O.O.D. Music artists including Nas, Kids See Ghosts (West and Kid Cudi), Teyana Taylor, Pusha T, and perhaps most notably, West himself, all of which are sure to make appearances on your favorite year-end lists. That said, as for Lyrical Lemonade’s list, we’re focusing on West’s newest solo release, Ye, and the greatness of a project that derives from such a genuine pocket of passion and creativity. Both lyrically and sonically, Kanye makes it a point on this one to present the most uncompromised and undiluted version of his artistic self, and as a result, the music is incredibly clear cut and refreshing in ways that will surely impress fans of Kanye both old and new. The vivid, undying life that resides in songs like “Ghost Town” and “No Mistakes” is bombastic and lovable in ways that bring us one step closer to Chicago’s own, while the unforgettable tagline “I hate being bi-polar, it’s awesome” acts as an unavoidable thesis to a deeply emotional project, fueled, in part, by a medication-free Kanye West who refuses to recognize any bounds of his creativity. Ye captures a moment in time, and for that, it’s the kind of project that we’ll be playing for years to come. We can only hope that 2019 will be as bright and active a year for G.O.O.D. Music as 2018 was! Over the past few years, PIVOT Gang leader Saba has been making waves as an undeniably promising act coming out of Chicago. Each year, he seems to be growing in popularity, but this shouldn’t come as a surprise, because the road of realized potential from 2014’s ComfortZone to 2016’s Bucket List has now come entirely full circle with hands down one of 2018’s best projects, Care For Me. Personally, I’ve been a fan of Saba’s music for damn near half a decade now, and to see him blossom into the extremely talented artist that he is today has been both a blessing and a privilege, to say the least. Saba hitting his stride musically is not only a proud moment for Pivot Gang and its fanbase, but for Chicago as a whole, as few artists represent the passion of the city better than this young star and his endless of supply of thoughtful storytelling and charismatic anthems. That said, the production on Care For Me was absolutely FLAWLESS from top to bottom, and this wasn’t even the best part, as Saba brought forth his most refined rhymes and melodies to date. Needless to say, there were countless amounts of rewind-worthy verses and moments on this tape that I still find myself going back to quite frequently, and with the level of care that Saba put into his storytelling, this is a natural result of pure hard work and skill. Nobody is painting pictures of growing up in Chicago as vividly as Saba right now, so much so that I truly felt like I was standing next to him watching things play out on a number of different occasions across the project’s duration. Saba simply outdid himself in terms of turning his pain and grief from tragic events into impactful & sonically pleasing music, and consequently, Care For Me is more than worthy of its praise as an extraordinary, inspiring, and eye-opening album. 2018 was the year of Juice WRLD. From the initial spark of the Cole Bennett-directed “All Girls Are the Same” to a subsequent collaborative album with bona fide trap star, Future, this Chicago-born talent has become one of the fastest rising stars in the world over the past 12 months or so, and while he continues on an insuppressible up-trend, it’s important to remember that the 20-year old artist can’t even legally drink yet. He bends together the worlds of emo and rap at his own will, all while using an addictive set of vocals to communicate heartbreak and its residual effects in ways that fans can easily resonate with. Juice WRLD is the kind of artist whose thematic style makes him effortlessly lovable to any kind of listener, and his clear knack for crafting hits has continuously channeled this, as shown throughout Juice’s 2018 album, Goodbye and Good Riddance. 17 songs long, this project is just about as honest and as vulnerable as it gets. One track after another, he communicates his pains by pouring his heart into each and every note, and as a result, the entire album possesses a personal touch that prompts its audience to keep clicking replay. We here at Lyrical Lemonade have been avid Juice WRLD supporters ever since he first came to the spotlight, and as we head into 2019, it looks like this Chicago native is going to keep making his way toward the top as far as music goes. That said, in a well-deserved display of talent, Juice WRLD’s Goodbye and Good Riddance simply has to take on the top spot on our list for 2018. We can be sure in saying that there will be plenty more hits to come from this budding star in the next 12 months.